This whimsical tree is a clever way to use old wine corks. If you’re like me and can’t part with your old wine corks, then you probably have thousands of them filling up bowls around the house. This is easy to make with just a few supplies, fill your house with cheer and this fun decoration. Begin at bottom by gluing corks around the edge of the cone. Let set a minute before gluing the next row, if needed. You will need a very sharp craft knife or other knife to trim the edges off sides of corks to make them fit (the last one in the row). With needle nose pliers bend wire into the shape of a star and push into top cork. How about a garland using wine labels? 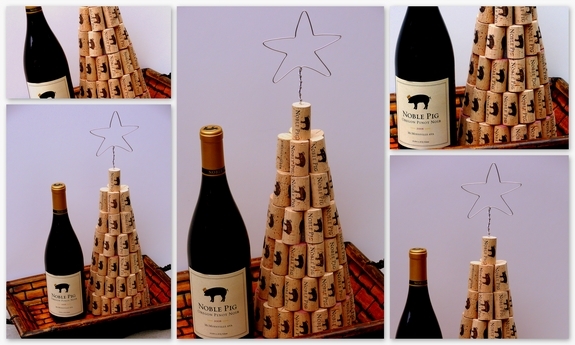 I could probably make 50 of these with the wine corks I have saved and have on hand right now! Ohh, I smell a craft sale in my future. . . ! Thanks for the cute idea! Thanks for your blog. I love it! Please keep the wine cork craft ideas coming…I’ve got supplies standing by! What a great idea that is! Okay, your corks and this tree are adorable. 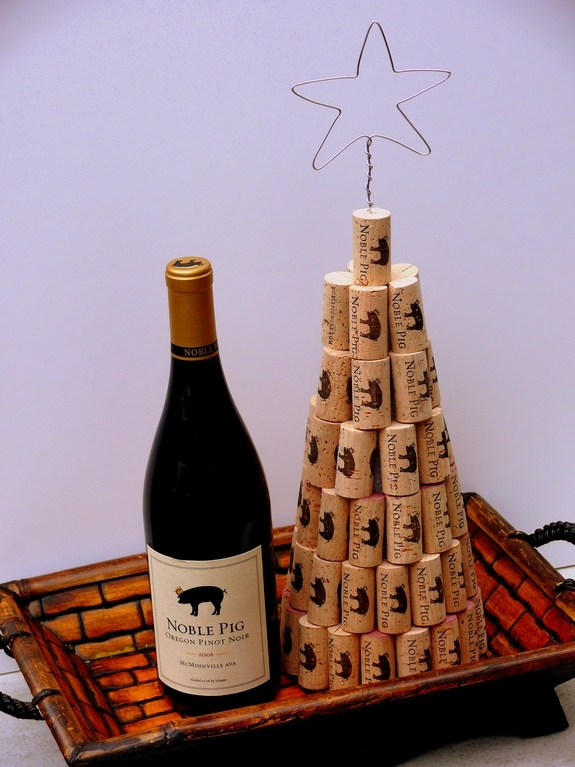 Giggle, I can see it now “honey, I have to order more Noble Pig wine so I can make a Christmas tree”. Hey, it works for me! I love that Christmas tree! I’ve got enough corks saved that I most certainly could build one of those. And by the way, I love my Noble Pig cork key chain. I get alot of comments on it. Great idea. Cathy, this is too great! Right now, I’m actually saving up corks to replace my old (ugly) cork board from the 1970’s (I think). I’d also love to try this tree next year. Thanks for the *recipe*! We had one bottle of the Pinot Gris with turkey day dinner and plan to have the other Christmas Eve. It is an outstanding wine, just to our liking. I do still love my Noble Pig key chain. It’s oddly become the easiest thing to find in my bag. Who knew? Again, thank you! Happy Hanukkah & Merry Everything!